I’d like to convert my DVD movies to digital form and then play them from the Mac mini connected to my TV. The problem I have is that the Mac I use to rip DVDs is in my office and the mini (which lacks a DVD drive) is in the family room. Is there some way to easily move these movies from one place to the other over the network? It’s a reasonably simple thing to do. First, configure your Mac mini so that you can share files with it. Do this by launching its copy of System Preferences, select the Sharing preference, and enable File Sharing. On that same Mac launch iTunes and keep it running for the rest of that Mac’s natural life. On the Mac in your office, within the Finder choose Go > Connect to Server and in the window that appears click on Browse. Select your Mac mini and click the Connect As button. In the window that appears make sure that Registered User is selected and then enter the user name and password for the Mac mini. Also enable the Remember this password in my keychain option and click Connect. 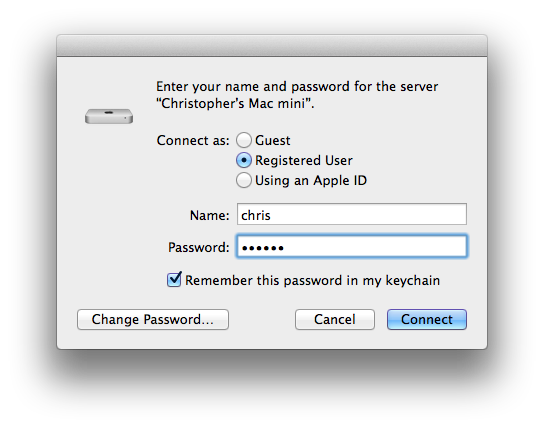 Now that you’re connected to the mini, select the user account that controls iTunes on that computer. Dig down and open Music > iTunes > iTunes Media. Within the iTunes Media folder you’ll spy an Automatically Add to iTunes folder. There is a folder action attached to it that will cause anything placed in that folder to be added to iTunes. Hold down the Command and Option keys on your office Mac and drag this folder to its desktop, thus turning it into an alias. Now, when you want to add a movie to the mini’s copy of iTunes, just drag it onto the Automatically Add to iTunes alias. The movie will be copied from your office Mac to the Mac mini and, thanks to the original folder's folder action, be available for your viewing pleasure.